I should talk about failure. It's a big part of craft. It hurts a lot, and it's absolutely the most poignant way to learn. If this blog is a record of my learning, then it's gotta include some serious mistakes. 3 bars of 1095/15n20 ready for more patterning. My big project going on last semester was not the kard I made, nor the other knives I finished. On-and-off for March and April I was working on an historically conjectural langsax design. I love the idea of a langsax; don't get me wrong, I love swords, but there's just something so awesome about a sword-sized knife. "War-knife" is a pretty compelling and intimidating compound, but still doesn't truly encompass the nuance of the sax. 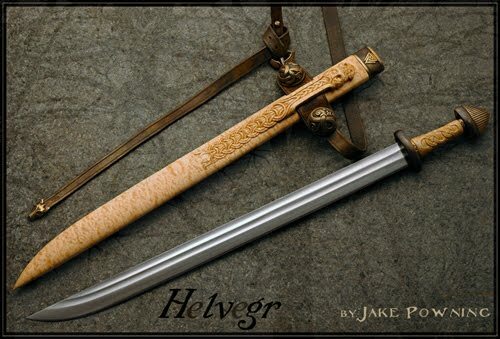 When it comes to modern re-imaginings of the langsax, I see that it's pretty common to follow the direction of the Viking-age single-edged sword-hilted type like those found in Norway (landmark examples being Jake Powning's Vidirhrafn and Helvegr, as well as J. Arthur Loose's Sword of Ice and Elding and Petr Florianek's Hafuthupnari) and embrace the swordy-ness of the langsax. JD Smith's sweet twisting jig. 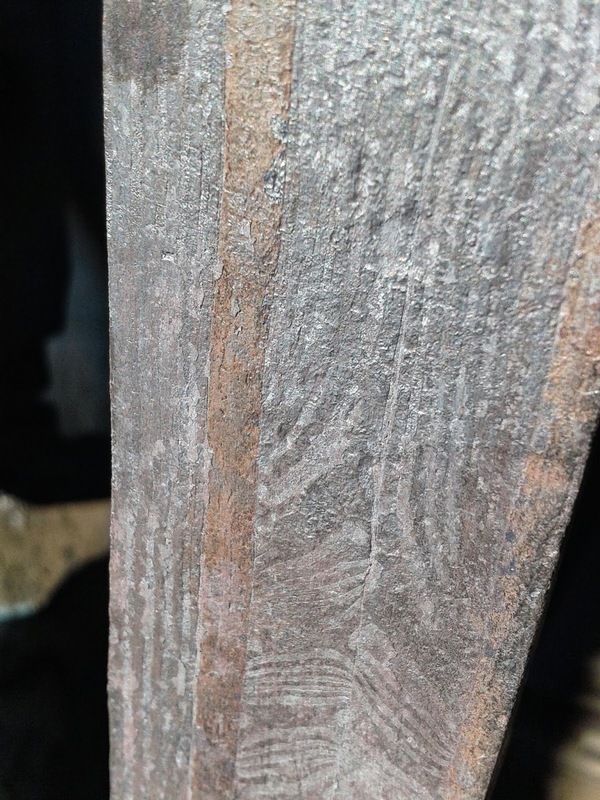 The other route, it seems to me, is to follow the enticing Owen Bush-esqe example of the oversized (and definitely historical) broken-back seax. Owen himself is of course expert in the BBS of all sizes as evidenced by his great portfolio of work, but his langsax versions are beyond impressive. I love a big broken-back with a pronounced clip, but the ones I like to make tend towards the much more understated shape of the continental and Scandinavian saxes. The lines meet more symmetrically at the point, but there's still a palpable asymmetry in handling and play of light with its triangular geometry. So I knew what I liked, and I wanted to scale it up. 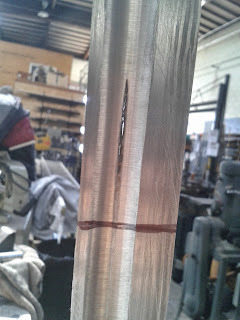 I started with a big billet of 11-layer 1095/15n20 and used the band saw to cut it into three bars. 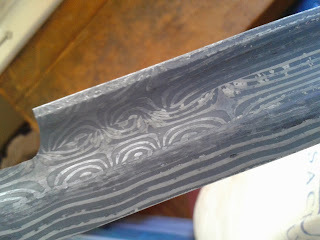 I put opposing interrupted twists in two of the bars and turned the third so that the striations of lamination would show on the flat of the blade. Then I forged out a few thin bars of wrought iron and aligned them so they'd border the twists on each side, and the edge bar on one side. This composition was specifically inspired by Luke Shearer's blade for his collaboration with Myles Mulkey. 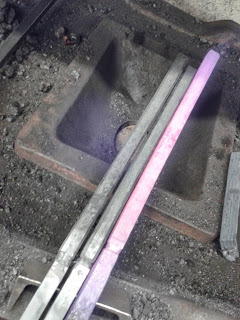 So on the left is one of my twisted bars, re-squared for core welding after the twisting. Lots of my free time at MassArt was spent on this, but one weekend in March the bars left Boston for Baltimore and came back entirely different. Five bars tack-welded on the ends to hold them until welded. 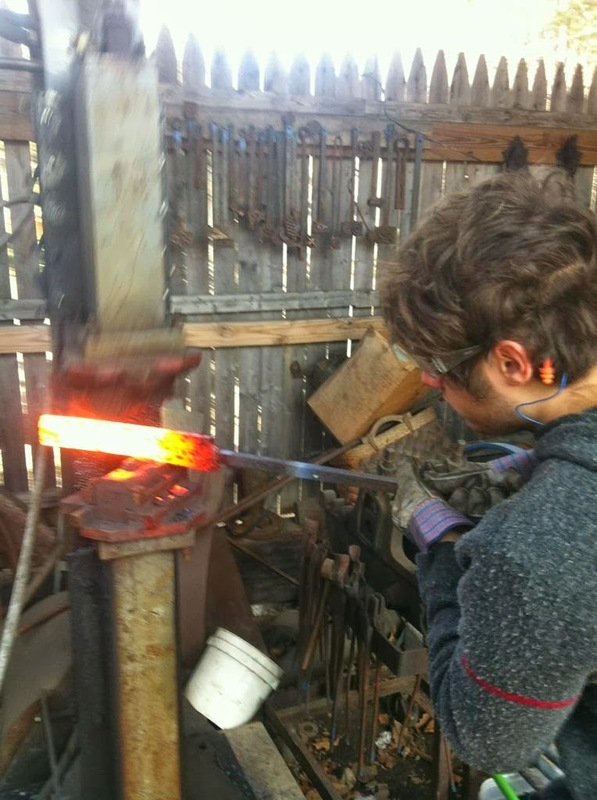 Matt and Kerry Stagmer own and operate Baltimore Knife and Sword Co., a wonder of a beautiful rural shop on the more distant outskirts of Baltimore, MD. 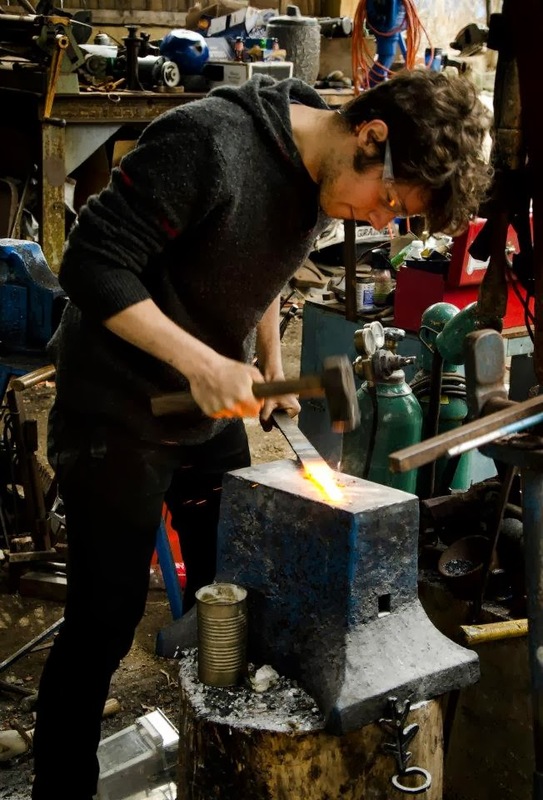 With a great menagerie of steel workbeasts and constantly impressive characters such as New York's own Sam Salvati and the talented armorer, cutler, and painter and intellectual Ilya Alekseyev, it's the perfect place to host a hammer-in. 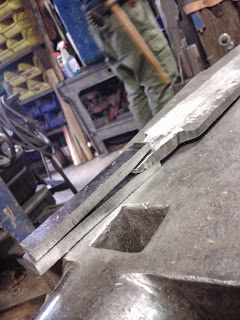 Just like in any other wonderful shop, the tools came in all sizes and varying degrees of functionality and riskiness. I got well-acquainted with lanky custom-built power hammer whose bolts needed constant tightening to prevent the (250lb?) ram from falling out of its tracks. But as long as you did that, it worked a wonder! Smooth and powerful action, and very controllable results. 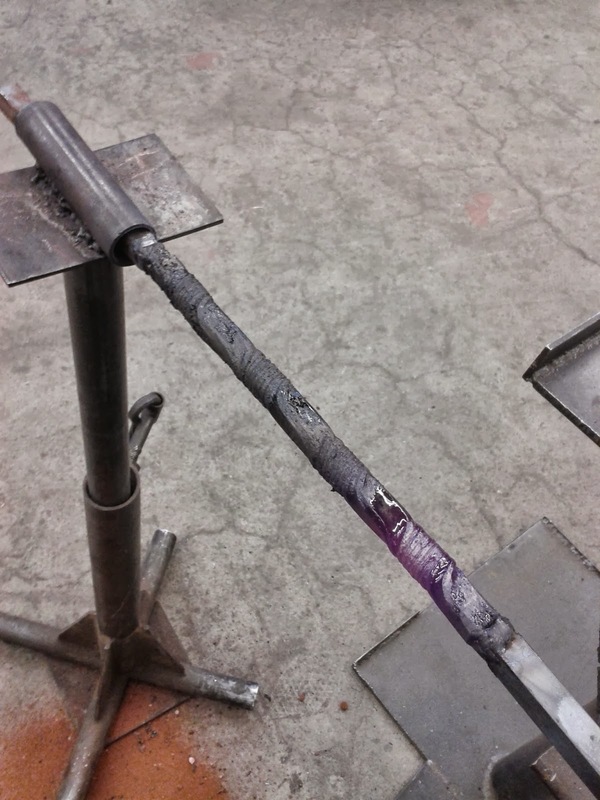 My welds went swimmingly, my drawing smoothly, and my excitement with the process mounted. I'd never had such success with such ambitious designs before! I took care not to draw out my twists too much and to leave enough thickness on the back for a solid spine and enough on the edge to allow me to keep everything aligned in the grind. It was an absolute pleasure to draw out and forge in the profile and bevels by hand, on a stout and timeless sawyer's anvil, using a traditional bladesmith's weight-forward hammer made by Sam Salvati and owned by Matt Venier, fellow New Englander and incredibly talented maker of 'Japanese inspired blades...by traditional and modern methods', in his own words. It was an awesome experience to be creating in the midst of a bustling hub of other people creating, all sharing enthusiasm and momentum, admiration and criticism. The whole atmosphere was heightened by the crisp day framed in the subtle greys, browns, and greens of the Northeast that I love so well. Besides a great number of top-notch Bader grinders, the BKS shop houses an unfairly high amount of (near) perfect anvils, well-used and well-taken care of. This one on the left I lay the sax on to think about what I would do next. 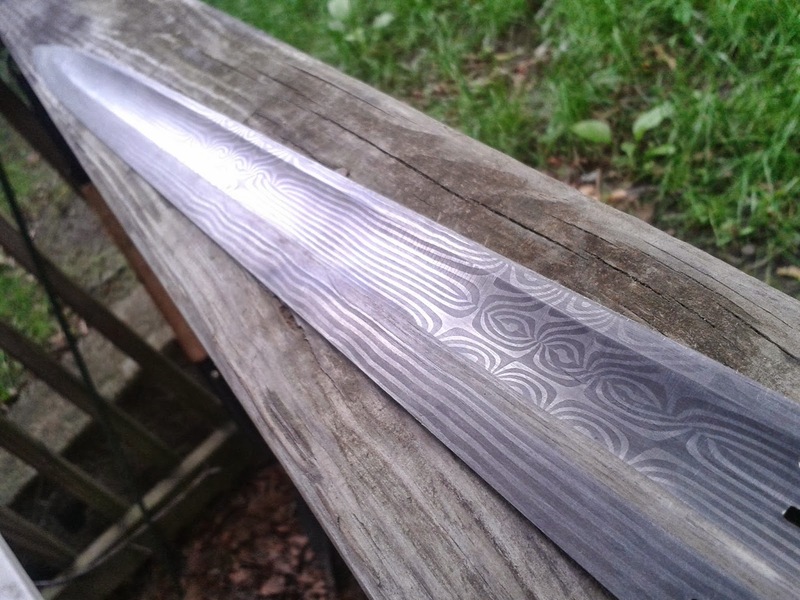 I wanted to maximize the amount of visible pattern-welded finished product and to not obscure any twists with the handle, but had left myself little space at the top of the blade, so I decided to go the most historically accurate route and forge a stub tang from the blade material and then forge-weld on a longer tang of soft and pliable wrought iron. 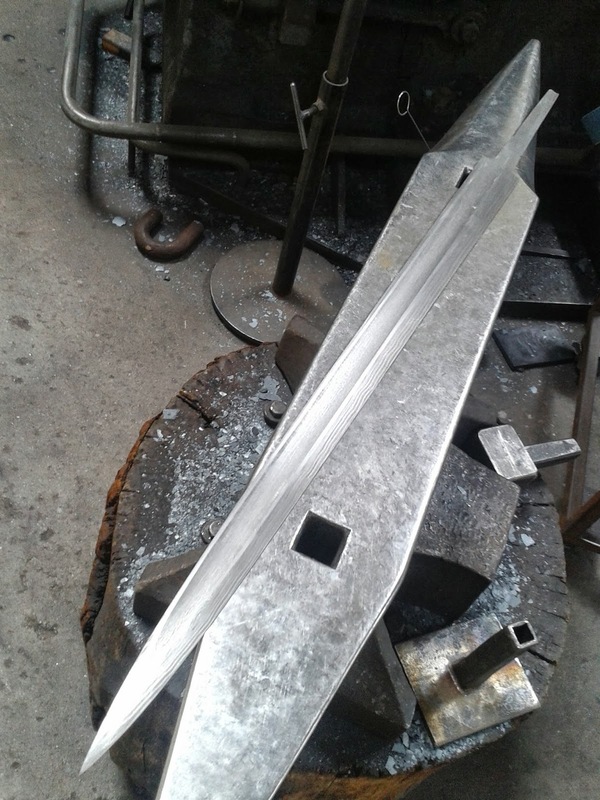 After that, it was weld the tang on, the specifics of which I gathered from the lovely picture tutorial by blacksmith/bladesmith Josh Burrell in The Second Sword. Josh's bone-knowledge of the craft and the form of the material runs deeper than most people today experience in their whole lives, and I would take his word for the authenticity of an item over that of any intellectual; his knowledge is also vast but his practical sense truly lights the way for anyone who would see into the past through this craft. 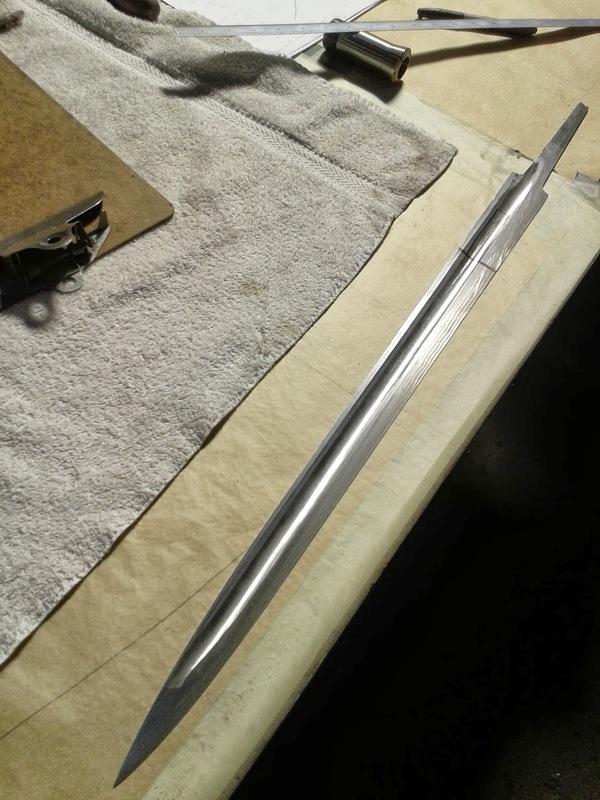 The tang-welding went flawlessly and I took the langsax triumphantly home to Boston where I ground away for hours on end in the MassArt metal shop, under the watchful eye of JD Smith. I was very pleased with the grind and began wondering how the sax would fare in heat-treatment. I was so in love with the symmetry and cleanliness of my unfinished product that I dared not normalize it or quench it without careful deliberation. My past experiences with the heat treatment of single-edged blades have shown me that warping is more or less inevitable. 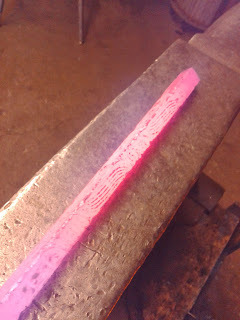 I have never made a sax that did not dip forward in the quench (or "nose-dive" in bladesmithing terms). I began to research the subject more, familiarizing myself with the Japanese term 'sori', which refers to this blade curvature in the quench, a cultivated attribute of Japanese swords. 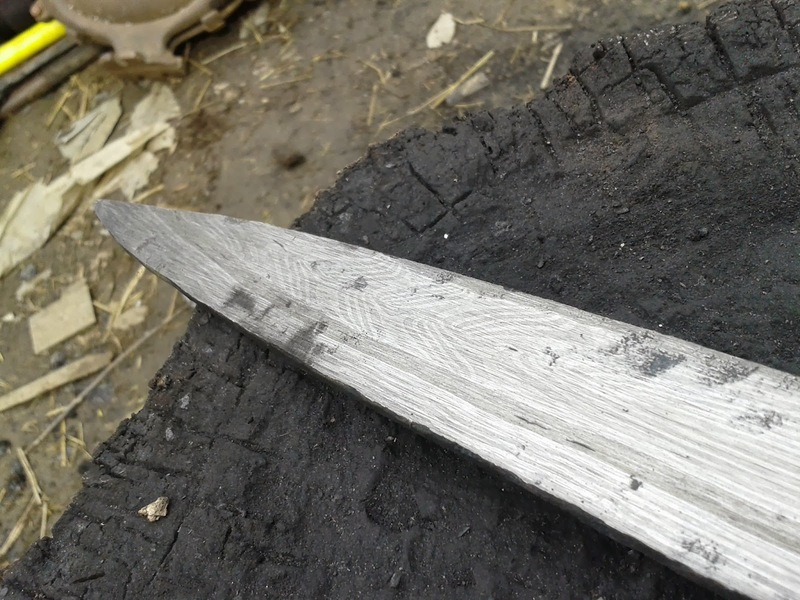 The word has been borrowed by the bladesmithing community and differentiated by "positive" and "negative" sori, meaning backward and forward sabering, respectively. My research revealed that negative sori usually occurs in oil quench and positive in water (traditionally Japanese). The reason it occurs at all is the relative rate of crystal change and degree of cooling contraction in the thin edge and the thick spine. I thought perhaps I'd normalize it to induce a negative sori (which happens for the same reason) and then quench in water to counteract it. 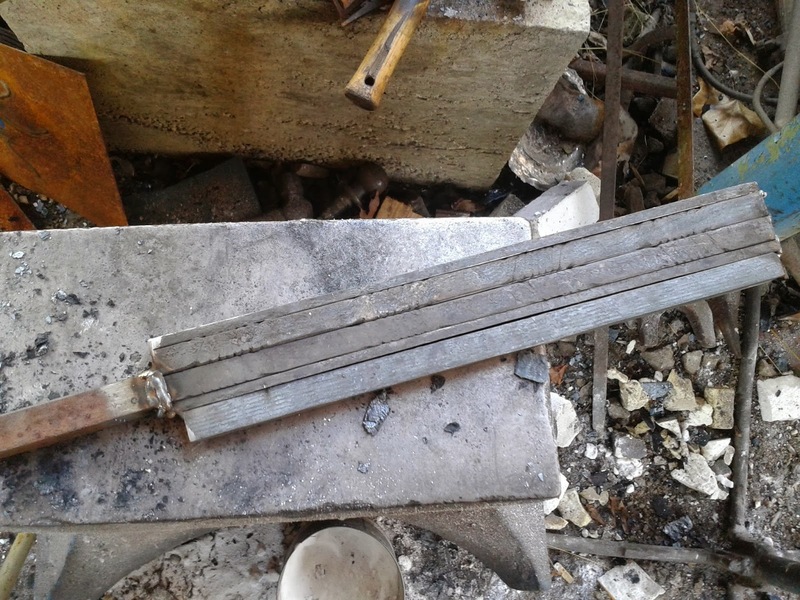 I proposed this on Don Fogg's Bladesmithing forum and was informed by such senior members as Peter Johnsson that it was not a good idea. Owen Bush threatened to "personally can my tomatoes" if I water quenched it. Back to the drawing board. I decided to try to equalize the masses of each side of the blade by grinding a deep fuller into the thicker spine side. I knew it would dig deeper into my twists to reveal the twist pattern I desired, and I needed the practice, so I went for it. I was visiting the workshop of Jim Austin in Oakland at the time, and went for it with his little old grinder with a one-inch contact wheel, on which I had first been shown how to grind a fuller by Jeff Pringle. It went beautifully. I stoned it intermediately with a rough stone, which kept things straight but dug deep into the steel. The deep scratches it left, coupled with the small diameter of the wheel were my undoing. All of a sudden the middle of the fuller went black as I passed it over the wheel. That made no sense. I held it up to the light. Against all my disbelief, light shone through a crack. I was still in my grinding zone, and managed a few moments of complete denial, bringing it back down to the wheel for a few more passes before I turned off the grinder and beheld my mistake with mind-numbing clarity. I laid it down on the table and went back to my uncle's house. 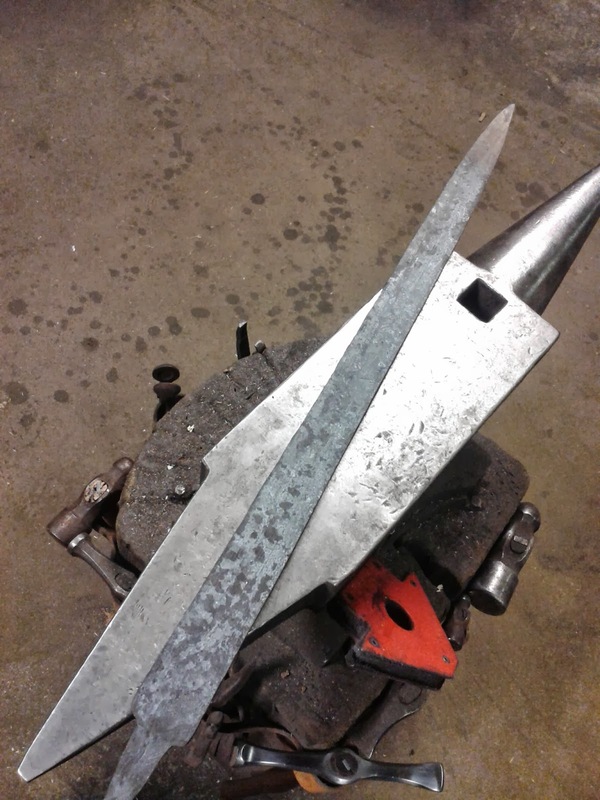 When I came back the next day, I cut the shoulders up above the crack and sacrificed one of the four twist sections and about six inches of blade. 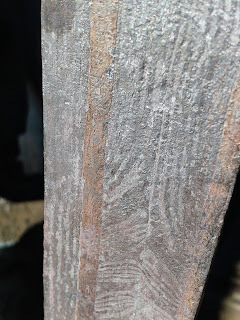 I went back to the grinding wheel to even things up but it was already doomed. I went through the fuller again, and lost another twist section. I felt like I was just going down in flames. I finished what was left of the blade anyhow; the bottom half remained. I brought it to Venier Forge when I was back in Massachusetts to harden it with a number of other blades. It was so thin in the middle of the fuller that it ripped like paper in the quench. I should also mention, ironically, that the fuller did counteract the nose-dive somewhat, but would probably have been better wider and shallower. 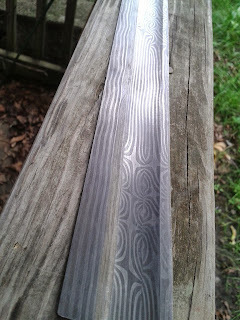 Yeah so anyway, here are some pictures of the pattern. It looks pretty alright, and my fuller's pretty straight. Writing this, I've re-lived a bit of the pain of it, but really I feel much more entrenched in my position as a student and much more concrete in my knowledge. When you sort of float from success to success, it's hard to know if you have any even footing to fall back on or if you're just a reckless Icarus who could come crashing down at any moment. It's a pretty relatable human condition in the end, failure, and I'm glad to experience it doing something I really care about. Too bad about the blade, but it doesn't mean what I did right didn't happen, and that I know one way not to do things in the future. Bonus, right??!? Keep it up! It's a beautiful creation, even as a failed project!